Before I start, let me get one thing straight, the Shogun is a proper 4x4, not a flimsy, car-like AWD SUV, therefore I won’t be moaning about how it isn’t silky smooth or remain level around fast corners, got it? Cool, we’re on the same page. Mitsubishi say that the Shogun is aimed at true off-road drivers who demand a comprehensively equipped, reliable and cost-effective vehicle with proven all-wheel-drive ability. And they’re right, this classic off-roader combines four-wheel-drive go-anywhere ability with a Euro 6-compliant turbo diesel engine, and is one of the few cars in its class to still offer a choice of either three-door short wheelbase or five-door long wheelbase versions. Whether I was driving in town, motorways or country lanes, the Shogun didn’t disappoint me, in fact it actually gave me a bit of a thrill. With 187bhp coming out of the 3.2ltr common rail diesel, it felt quite sprightly, especially on the narrow roads heading back from Hawes after a day greenlaning. As someone who’s used to great lumbering 4x4’s, I didn’t find that the shogun leaned significantly around corners, nor did I find it cumbersome in any way, but you may have a different opinion, especially if an Audi A4 is your usual ride. Its agility on road will no doubt having something to do with Mitsubishi ditching the traditional ladder chassis and using a steel monocoque with extra strengthening in the floor instead, something I only recently learnt. Doing away with the separate chassis means the engine and transmission can be mounted lower down which lowers the centre of gravity, improves handling and reduces weight, which in turn means greater performance and economy. On faster A roads and motorways the shogun gave a relaxed drive, of course the huge tyres, door mirrors and physical size of the car generates wind noise, but not what I would call excessive. 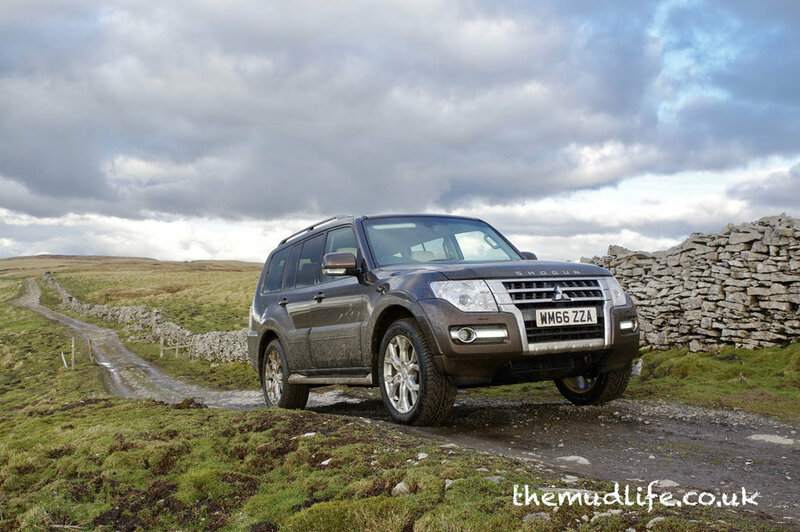 As well as a few local green lanes, we took the Shogun on a trip to North Yorkshire to explore some lanes that I hadn’t driven before - it excelled. Normally you would expect a little bit of wheel slip in certain conditions, but the Shogun didn’t, and I was listening carefully. From loose stone, muddy inclines and wet rocks, the Shogun crawled over everything without any fuss whatsoever. What’s that you say? You want to balance it on its 2 opposing wheels? No problem, the Shogun can handle that too, just like it can tow 3,500kgs (LWB). The 2017 Shogun remains unchanged from 2015, which is no bad thing, however, I will start with a couple of negatives. I still find the driving position a little too narrow. The problem as I see it is that the transmission tunnel is a little too wide and the electric window switch panel on the door protrudes into your right knee too much, though after a week I became used to it and it didn’t hurt as bad. My second, and final issue with the Shogun are the seatbelt release buckles, they don’t half dig into your upper thigh! And it wasn’t only me either, people less, erm, chunky than me complained about it too. Raising the height of the seat alleviated the problem slightly, but not fully. Apart from the narrow cockpit, the driving position is excellent, not only are all the switches to hand, but you’re looking down on the dash and bonnet which, when coupled to the large windows, offers you a commanding view of the road. Once sat comfortably your thighs are 90 degrees to the floor, just as you are sat on an office chair at a desk, if you’ve ever driven and old Range Rover, you’ll know exactly what I mean. The dash layout is good, though the speedo has a silver background which at times can be difficult to judge your exact speed, but again over the week I got used to it. Moving to the back of the Shogun there's no surprises that you get a huge amount of space, and the extra 3rd row of seats are handy too, but reserve those for smaller people. I hope you like automatics and diesels, because that's all you're getting! The 2017 Shogun has 3.2ltr, four-cylinder DI-D Common Rail turbo diesel with a 5-speed INVECS-II automatic 'box with sequential Sports Mode. Towing capacity for the SWB is 3,000kg and 3,500kg on the LWB. It could be argued that the 2017 model Shogun is one of the last proper 4x4s with a traditional high and low gearbox - which is appreciated when the going gets tough, especially when towing a heavy trailer. 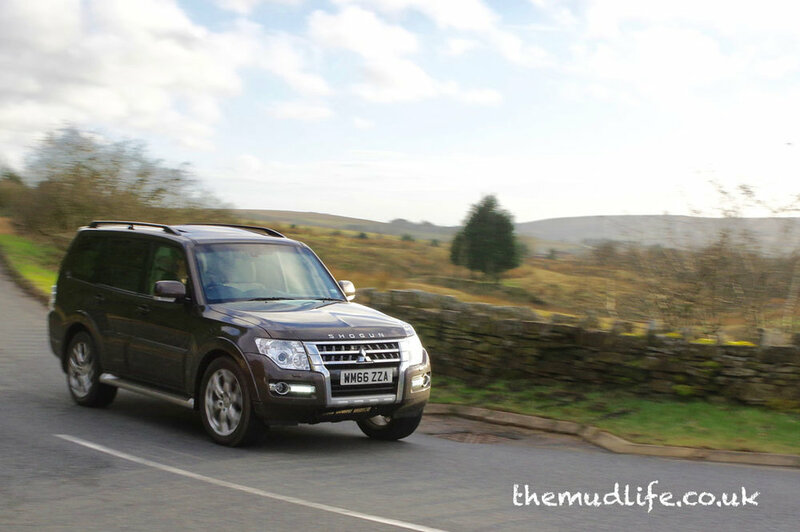 Ever since the first-generation Shoguns arrived in the UK back in 1982, they have built up a 35-year reputation for being a tough but affordable vehicle with go-anywhere off-road capability as well as being a capable motorway cruiser. If I said it was agricultural, I don’t mean that in a negative way, not like a Series 2 Land Rover, but rather in a dependable and rugged manner. If you are swapping in your Sportage or 4-door saloon for a Shogun, you’ll certainly notice a difference, but it is what it is, a classic 4x4 that’s perfectly at home in the country as it is on the daily commute. It’s plush inside, has the driving position of a Range Rover and is as tough as a Defender, so what isn’t there to like? Well, personally I’m not that keen on the styling, but that’s just me. Overall the 2017 Shogun was great to live with for a week during which we explored some of our ancient rights of ways, commuted, and enjoyed a few long distance treks. The question that I usually like to end on is, would I buy one? If LWB model came up in my price bracket, then the simple answer is yes, but I’d have to do something about that damn seatbelt release buckle! Prices from: SWB £32,645 & LWB £35,045. Servicing schedules for the 2016 MY Shogun continue to be 12,500 miles/12 months, whichever comes rst. The vehicle’s warranty covers the rst ve years of ownership or 62,500 miles. In addition, every Shogun is supplied with a 12-year anti-corrosion perforation warranty and three years of pan-European breakdown and recovery cover. And the Mitsubishi Service Plan (MSP) covers the rst three scheduled services.